Today I would like to start up an artistic-musical break to talk about the immaginative world of an artist dear to many teenagers, and not only. The reason why I chose this artist is my absolute admiration for his incredible communicative ability and for the originality of his work: where 'mass' perpetually tends to copy, from time to time, someone distinguishes himself for the global vision of his artistic expression. This axiom is not true for everybody but, for Mika (Michael Holbrook Penniman) it certainly is. Entering his website is an absolutely vitalising experience, I felt a bit like Charly discovering, step by step, the Chocolate Factory. No Mika Wonka in his top hat to greet me at the entrance, but still I somehow felt at home: instead of the Golden Ticket there are Mika's Magic Numbers, instead of the chocolate-waterfall there is a panoramic wheel facing a world made of bright colors, well, how could anyone resist it? 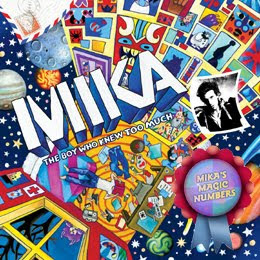 His fans are welcomed by a virtual embrace, pampered with a quantity of little attentions, drawn into and, most of all, acquainted to what happens, every minute, at times by Mika himself. It is not my task to establish if he is just a subtle comunicator or is genuinely enthusiastic about his work, though in approaching this versatile artist I had the feeling that, besides mere economic reasons that, of course, are not unwelcome, he has an unyeilding will to convey his artistic concept. Except for rare cases, I believe there are really few musicians (and authors) so deeply rooted in their own artistic vision and able to give it a transversal expressive form, who are also able to embrace other artistic branches. As an example just think of Mika's personal contributions to the artistic creations that go with his music. In The Boy Who Knew Too Much, together with his sister Jasmina (aka as DaWack) whom he worked with for the design on the first album, Mika was shrewd and modest enough to have other asrtists as well to support him: the awesome Sophie Blackall, talented Australian illustrator about whom I shall soon write more, and Richard Hogg, eclectic British designer whom he had already worked with in the past. "There's something dark and magic about a good picture book. The way those characters never leave you and attach themselves to a particular time of your life. The only thing I can compare it to is smells." It's as if those characters had crystallized in his mind and heart, forming a costellation of archetypes that seem to be a constant source of inspiration, of nourishing almost. The comparison to smells then I believe is even more significant in regards to the evocative power that, also nowadays, certain characters appartaining to his childhood might still have in his immagination. That "dark and magic" he refers to, that surfaces so well in his last cd, and of which childhood and adolescence are so fully spangled, is a constant and powerful theme in his songs: as if his melancholic inclination was playing hide-and-seek, disguised behind sequins and gaudy colours, protected from the superficiality of those who are listening simply to fill their ears with faint notes. I really hope that the great media success, with its grinding mechanisms, and the unavoidable maturity won't end up by eating away this great emotional and instinctive richness, that they won't transform that "childlike" smiling look into cynical disenchantment.